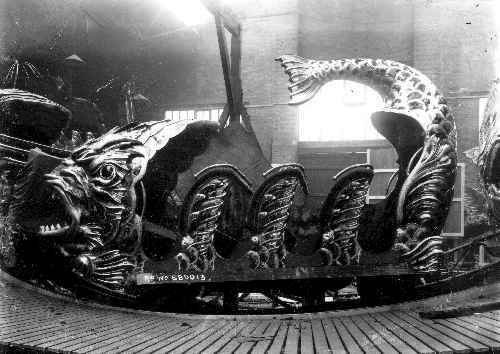 A 'Spooner' carved whale car of the early 1920s. Orton & Spooner was one of Britain's greatest amusement ride manufacturers, formed following the amalgamation of two separate firms in 1925. Orton's produced numerous rides, from early Switchbacks and Bioscopes to Ark/Speedways, Ghost Trains, even Roller Coasters. The Company finally closed for business in 1977, after falling into receivership. This exhibition of photographs takes visitors on a tour of some of the most popular rides produced by Orton's and is based on photographs from a brand new book, Men at Work, by the late Alan S. Howell, finished shortly before his untimely death. The book focuses on the talents of two of the greatest fairground artists of the Twentieth Century, Albert and Sid Howell (the author's grandfather and father respectively). If you enjoy the Exhibition then why not buy Men at Work and discover the full story of 'the fairground artists and artisans of Orton & Spooner'. Enter the First Exhibition Hall. 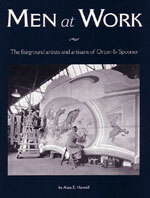 Click here to buy the brand new book Men at Work: The fairground artists and artisans of Orton & Spooner now.